You have probably heard or seen a picture of them. Pokémon that are different colors than normally seen with. An example of that could be a Metagross with a silver coating and a golden X on it, a dark green Zubat, or a black Rayquaza. The Torchic you may have obtained from Professor Birch may be a lighter colored orange and you may think the game is glitched up, but it isn't. As you can imagine, these occurences are very, very rare. Not very many people even have a shiny Pokémon to begin with. So how do you get them? It depends on very, very good luck to get a shiny Pokémon. You can find shiny Pokémon in the wild, in eggs, and in the battle tower, which is basically everyplace you can catch a Pokémon save for the Battle Tower in which you won't be able to catch the shinys there. Needless to say, you wont be very lucky if a shiny ends up there. 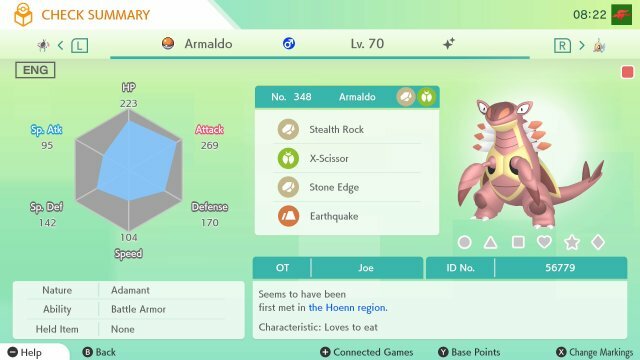 People have said that you can also meet a shiny when in your first battle against the wild Poochyena and Wally's Ralts as well. Basically, like I said, it revolves around how lucky you are. Now the bad thing is that the odds of finding a shiny Pokémon in the wild are 1 in 8,192 battles...all the time, meaning after 8,191 battles it'll still be 1 in 8,192 and not a dead cert that you will get one i.e. not 1 in 1 battles. This rate has been altered as of Pokémon X & Pokémon Y to make Shiny Pokémon more common. Now you'd think with a Pokémon this rare, it has to have good Individual Values and such. That's no longer the case. Shiny Pokémon are always going to end up with the same odds of good stats as normal Pokémon. They used to have set IV's in the Metal generation where it had 0 HP IVs, random Attack IVs and IVs of 10 in Defense, Speed, Special Attack and Special Defense, but since then and until XY, it has been based upon the hidden PID of the Pokémon. As of Pokémon X & Y, it is a 1 in 4,096 chance of finding a shiny Pokémon. In the fourth generation, a variety of things have changed in order to allow for the obtaining of Shiny Pokémon. First is a method commonly known as the Masuda Method, named after the game developer and the person who revealed it; Junichi Masuda. This method has you breed two Pokémon. However, one of the Pokémon must be of a different nationality than your game (such as a Japanese Pokémon on an English game). This will lower the chances of hatching a shiny Pokémon from 1 in 8,192 to 1 in 2,048 cutting it by 75% in Generation IV. However, in Generation V, it is boosted even further from 1 in 8,192 to 1 in 1,365.3. Generation VI has increased the likelihood even further thanks to the decrease in standard shiny rate, being 1 in 682.7. After each use of the PokéRadar, it requires recharging. This is done by walking 50 steps. Chaining goes even further in Pokémon X & Y due to the inclusion of Consecutive Fishing. With this, as you hook Pokémon with the fishing rod, you get increased chances of getting a shiny Pokémon. This will increase with each Pokémon you hook without leaving the spot, regardless of if you defeat them, capture them or run from battle. If you don't get a nibble, or if you move from the place you were fishing, you will break the chain. The chain also resets once you get a shiny Pokémon. Exact values are still to be discovered. Chaining is even utilised in Let's Go, Pikachu & Let's Go, Eevee. If you catch more of the same species of Pokémon in a row, the shiny odds will gradually increase. This caps out at 31 in the combo where it makes Shiny Pokémon 14 times more likely if you have a Shiny Charm. In Pokémon Black 2 & White 2, a new item is introduced called the Shiny Charm. This item, obtained when you have completed the National Pokédex, increases the chances of Shiny Pokémon appearing. As it's a Key Item, when you have the item in your bag, then the chances of encountering Shiny Pokémon in the wild is increased to 300% of normal, making it a 1 in 2,730.6 chance. If, however, you're using the Masuda Method to breed, it reduces it from 1 in 1,365.3 down to 1 in 1024 and, from X & Y onwards, 1 in 512! This Gyarados is the only Alternate Coloured Pokémon that you are guaranteed to encounter in these games. Before you reach Mahogany Town, you will be informed of problems at the Lake of Rage. Once you get there, you will discover that a Gyarados is rampaging in the lake. To calm it, you need to capture it or defeat it. Once defeated, Lance will request your help in stopping Team Rocket. After you have seen all the Pokémon in the Unova Dex, you will receive a License. This item, when shown to the airport attendant in Mistralton City, takes you to the Nature Preserve, a place filled with wild Pokémon. However, in the middle of this sanctuary is the rare Shiny Haxorus. In Generation IV and Generation V, nearly all the non-Shiny event Pokémon you obtain are coded to not be shiny. These Pokémon can usually be soft reset for IVs and natures, but they will never be shiny. There are a few exceptions for this, such as a couple of Kyushu events in 2012 in Japan. In addition to this, in Pokémon Black, White, Black 2 & White 2, several of the wild Pokémon are coded to not be shiny, specifically the legends Victini, Reshiram and Zekrom. In X & Y, none of the Legendary Pokémon can be shiny. As of now, the following Pokémon cannot be shiny under any circumstance. Starting in Pokémon Black & White, the developers started instituting locks where Pokémon could be caught in a wild but prevented from being shiny. These locks are mostly done on the signature legendary Pokémon of the games, but do range further. These Pokémon are usually available as shiny through other games and are only locked through the particular game listed. Pokémon Let's Go, Pikachu! & Let's Go, Eevee! Pikachu (Partner) Pallet Town - Let's Go, Pikachu! Eevee (Partner) Pallet Town - Let's Go, Eevee!